Experience since 1984, with thousands of clients proudly served, our focus is always quality work that gets completed with the utmost precision, with focus on customer service and on-time delivery. We are a friendly and respectful family owned and operated business. And as you can see below, our customers appreciate it. Thank you so much for helping to make our kitchen make-over a dream come true. Our granite counter-tops and window sill are spectacular. We appreciated your great advice, your prompt and courteous service and have rarely had the pleasure of working with such a professional team dedicated to COMPLETE client satisfaction. Thank you for making our Christmas a little more beautiful. You did excellent work - and that goes for the boys too. Have a wonderful holiday season - all of you. Just a few pictures of our new kitchen blended together with some beautiful granite countertops. Thanks for all your suggestions, help, great workmanship and speedy service. We have had many admirers and share your name with all of them. From the beginning, you were willing to drive two and a half hours to our place to show us all your samples at no charge. It made the whole process so much easier to actually look at the large samples in our own kitchen, with our wall colours, cabinets and lighting. So much nicer than looking at a huge slab on its side in a warehouse. We struggled to choose before this, but we immediately came to a conclusion on what we really wanted and placed our order right away. Estimated delivery was four weeks. NMG had a change in their schedule and our countertops were installed in three weeks. Awesome! Paul and his team arrived on time, laid out floor coverings and began the install process. Within a few hours the job was complete and our place left spotless. Thanks Barb, Paul, and everyone at NMG. You are all true professionals and we highly recommend your company. The counter looks great. You know the saying... happy wife, happy life! I must say the group of guys you have were very pleasant. It is nice to see a group get along very well. Thank you very much for supplying and installing the beautiful granite countertops! Your staff was very courteous and we were very impressed to have the job completed one day earlier than promised. Everyone who sees the change is very impressed. We will certainly recommend your product to our friends and others who may be interested. Your price was very reasonable!! THANKS AGAIN!! It was great to see how much you care about your clients and your work. The job was done with great professionalism. sure to promote your business. Merci beaucoup! We are extremely pleased with your product, the installation, the whole process. Everything is done in a professional manner. Should you ever need any references, please do not hesitate to call. It was great doing business with you. I am recommending you to everyone. Paisley Park would like to take this opportunity to sincerely thank each and every one of you for your professionalism and team work to ensure the countertop project was completed on schedule. We are thrilled with the finished product and look forward to working with you on future projects. I just wanted to say thank you for the wonderful job you have done from start to finish on our granite countertops. The island countertop turned out better than I had ever imagined. We simply love it. I added backsplash which finishes the look and complements the granite. Thank you again. I will be recommending you to all my friends and family. l have to say the countertops are absolutely beautiful and look better than l had anticipated. Your crew was very professional and the house was very clean. Jim appreciated this very much. Thank you very much for the quick and professional service. We are more than happy and would be available anytime for any references you may need. 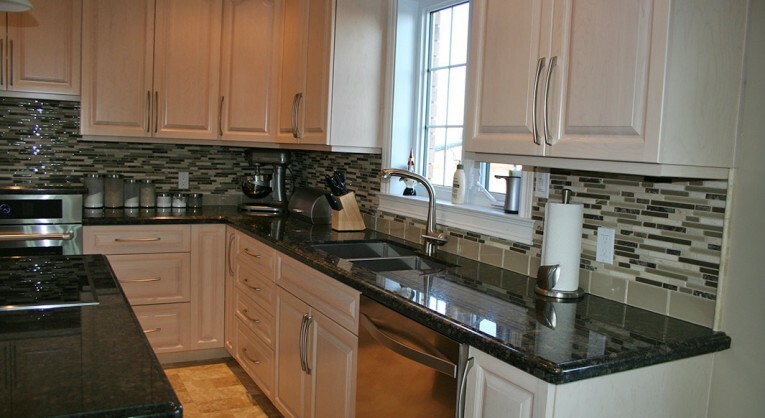 l have attached a couple of pictures of the granite countertops.We love them. It is our favourite place in the house. I tell everyone there is no other way to go! We may be building again in the late spring. You will be one of the first people I call to book. Thanks again! Just a quick note to thank you for everything you have done. I can’t stop staring at my kitchen. We can hardly wait to show it off! Thank you for your kindness, patience and above all, fantastic service. You have been an absolute pleasure to work with. We are so pleased with the kitchen. Everyone is amazed at the seamless installation. We want to thank you and commend you for your craftsmanship and professionalism. Producing superior quality custom granite countertops since 1984. A promise of on time delivery and second to none customer service.